The Six Inch Wide Biscuit Slicer can accommodate up to a five-inch diameter biscuit. Designed for single feed of biscuits, muffins or bagels. Ideal for start-ups or companies that wish to saw lower quantities of biscuits. 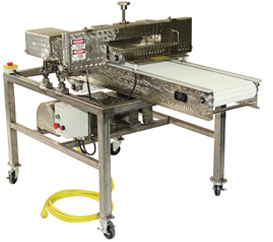 Using this saw will reduce your biscuit assembly costs by allowing you to purchase non-sliced biscuits. The unit can be modified to accommodate an automatic biscuit feeder and assembly line table or conveyor. The Twelve Inch Wide Biscuit Slicer shown at left can accommodate several biscuits being run through the saw abreast. This will increase the biscuit output up to five times. The unit can be modified to accommodate an automatic biscuit feeder and assembly line table or conveyor.